Q: Remote debugging is fine and dandy... but what about debugging my application locally? A: For those who don't want to deal with the complexities of remote debugging, want the simplicity of having everything on a single machine and/or do not have a full copy of Visual Studio 2005 or 2008... then local debugging can be the way, however can also be problematic and limited. It is highly suggested that if you install a tool like Visual Studio to a Home Server, that you only do so to one running in Virtual PC in case something gets screwed up, leaving your running Home Server pristine and untouched except for testing near final versions of your add-in. After downloading the Express Edition of your choice (C# or VB.NET is suggested), simply launch it and go through the setup process, accepting all defaults. During the setup process the installer will download the necessary files, install them and let you know when it's all done and ask you to reboot (which you should accept). So as to make Visual Studio on our Home Server more integrated with the development experience, we should tell Visual Studio where to look for the common Home Server assemblies that your add-in will need to reference, to do so you'll want to add a registry key as noted in Dev Tip #6, or download and import this file into the registry on your Home Server. Remember when using the project that due to the Visual Studio bug (2005, 2008) you will need to change the assembly name of the project. While the previous changes we've made affect the entire system, the next ones affect only the project that we'll be working with which means it is here you will want to create your new project (and save it) or open an existing one. Your method of configuration will depend on the version of Visual Studio you are running... if you are running a non-Express version of Visual Studio, skip ahead to the next section... otherwise get ready for a little bit of project file hacking. It is suggested that you back up your project file prior to following these steps in case a mistake is made. An alternative to steps 5 and 6 is that you can download this file, rename it as appropriate and place it next to the project file in question. In the above steps, you have configured your project to copy the new add-in to the C:\Program Files\Windows Home Server\ directory, and then optionally launch the Home Server if you wish to debug your add-in in it. copy "$(TargetDir)\$(TargetName). *" "C:\Program Files\Windows Home Server\"
Now your Visual Studio is configured to automatically copy the updated build to the Home Server Directory and launch the Home Server Console to test it out when you choose. When it comes time to debug... simply pressing F5, selecting the Debug -> Start debugging or clicking the Start Debugging will rebuild the add-in and launch the Windows Home Server Console, allowing you many of the same debugging features that you are used to. This is caused by the Home Server Console throwing an exception that it probably shouldn't. Unfortunately here we hit a limitation the Express Editions which we can't so easily work around, while the non-Express versions Visual Studio allow you to attach to a running process at any time, Express only allows you to attach to the process when first launching it, nor does it allow for launching of the project (or some program that will use it's output) from the development environment without attaching the debugger as you can in the higher versions. Hopefully some of the issues in the Home Server Console that keep it from being easily debuggable will be resolved in a later update or version. 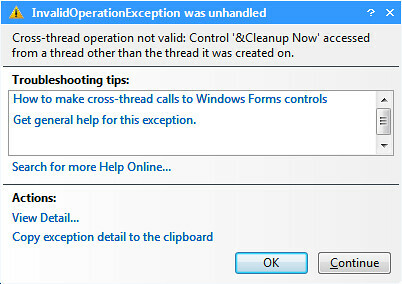 In the mean time however this means that debugging and testing an add-in in a copy of Visual Studio Express that is running on a Windows Home Server is much more difficult than than if a higher version is used, however with some care these errors can be mitigated by slowly learning which operations you carry out raise an exception. The most common place I've seen it for instance is when entering Settings. This then allows you to have the debugger attached when working with your settings page, just be sure to change it back before releasing your new add-in to the world. Next week I'll go into the FancyListView control which is used by most of the existing tabs to show a list of data with multiple attributes attached and show you how you can add status icons and even a progress bar in places you cannot easily do with a run-of-the-mill ListView control.